Despite being inside, sitting on an airplane leaves you more exposed to the sun’s harmful rays than you may realize. “Although plane windows can block UVB rays, UVA rays can still pass through and given the elevated level, the UV rays don’t have to travel as far to cause damage and can be much more intense at higher altitudes,” says Dr. Marisa Garshick, NYC-based dermatologist and assistant clinical professor of dermatology at Weill Cornell Medical College. More than 20 percent of young white women who’ve been to a tanning salon become addicted to tanning — even though doing so raises their risk of deadly skin cancer and premature skin aging, a new study reports. Women who were dependent were more likely to have begun tanning at an earlier age, to be concerned about their appearance and to have depressive symptoms, compared with women who weren’t dependent. Nearly 47 percent of the women were college students. He said women need to understand not only the risks of tanning but to be on the lookout for signs of tanning addiction, such as symptoms of depression. You may not see the sun’s rays on a grey, cloudy day. The clouds do look like they won’t let the harmful rays get through, but they do get through whether it’s summer, spring, winter of fall. Always wear sunscreen to keep you skin and yourself safe. Clothing When possible, long-sleeved shirts and long pants and skirts can provide protection from UV rays. Clothes made from tightly woven fabric offer the best protection. A wet T-shirt offers much less UV protection than a dry one, and darker colors may offer more protection than lighter colors. Some clothing certified under international standards comes with information on its ultraviolet protection factor. If wearing this type of clothing isn’t practical, at least try to wear a T-shirt or a beach cover-up. 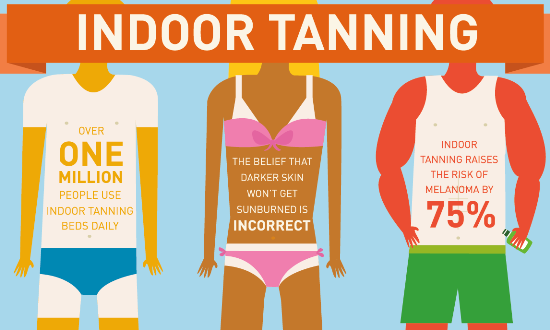 Keep in mind that a typical T-shirt has an SPF rating lower than 15, so use other types of protection as well. Hat For the most protection, wear a hat with a brim all the way around that shades your face, ears, and the back of your neck. A tightly woven fabric, such as canvas, works best to protect your skin from UV rays. Avoid straw hats with holes that let sunlight through. A darker hat may offer more UV protection. In America, more skin cancers show up on the upper left side of people’s arms than the right side. And It doesn’t matter what color you are. Why? Our left arms are more exposed to sunlight when we are driving. In countries where people drive on the opposite side of the road, the right arm gets more sun exposure. Don’t forget to close your windows, though even some rays can still get through and cause damage, and don’t forget to apply a good sunscreen. CATEGORY POSTS Select PostDress For Sunsafe SuccessDriving May Be Hazardous To Your Left ArmR U Flying?